The Association on American Indian Affairs is accepting scholarship applications for the Spring 2018 semester of the 2017/2018 school year. All scholarships are for graduate and undergraduate students from federally recognized tribes except for the Allogan Slagle Memorial Scholarship. Some of these scholarships are curriculum specific. Students from federally recognized tribes are not eligible for the Allogan Slagle Memorial Scholarship. Applicants enrolled in non-federally recognized tribes are only eligible for the Allogan Slagle Memorial Scholarship. This scholarship is open to graduate and undergraduate students in any curriculum. Click HERE to learn more or to apply. First Alaskans Institute is pleased to announce our recruitment for the 2018 Public Policy Fellowship to place up to two Alaska Native or rural Alaskans in Juneau from January to April 2018 during the Legislative session. The goal of the legislative fellowship is for young Native leaders to become familiar with the legislative process, to understand their own histories and how their cultures inform their own leadership, and to learn how emerging policy issues impact Alaska Native peoples, communities and the State of Alaska. Participants will gain meaningful work experience while also supporting the flow of information between the our State Capital and Alaska Native communities. Fellowship applications are attached and also available on our website: ellatonuchuk. Do you know an outstanding education advocate in the community who deserves recognition for their commitment? You can submit a nomination form online for the 2017 Bernice M. Joseph Education Advocate of the Year award HERE. Deadline: Friday, Dec. 1, 2017. The Bernice M. Joseph Advocate of the Year award recognizes a business or individual in the business community that have consistently shown a commitment to education through sustained partnership, outreach, or career development opportunities that improve the educational experience of students and demonstrate partnership innovation and creativity. All employees of Chamber member businesses are eligible to receive this award. The staff of Doyon Foundation wants to wish everyone a Happy and safe Thanksgiving holiday. We also want to remind everyone that our office will be closed on Thursday and Friday, November 23 – 24, for the holiday. We will resume normal business hours on Monday, November 27th. 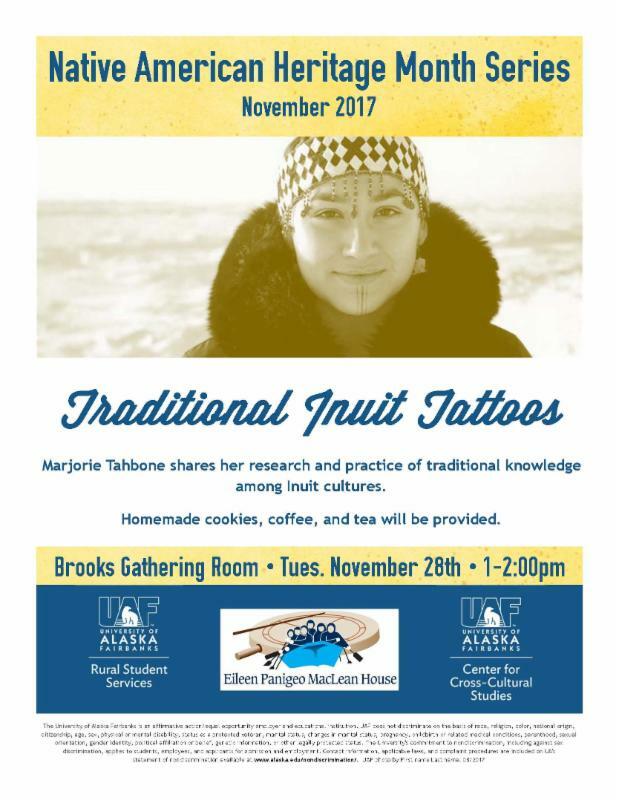 Marjorie Tahbone shares her research and practice of traditional knowledge among Inuit cultures. 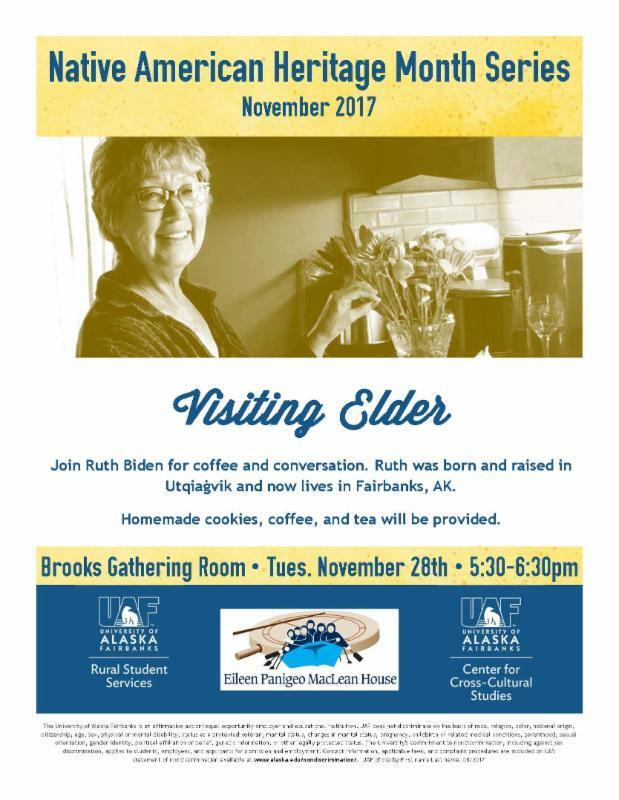 Join Ruth Biden for coffee and conversation. Ruth was born and raised in Utqiaġvik and now lives in Fairbanks, AK. Start your morning with Kenneth Frank. 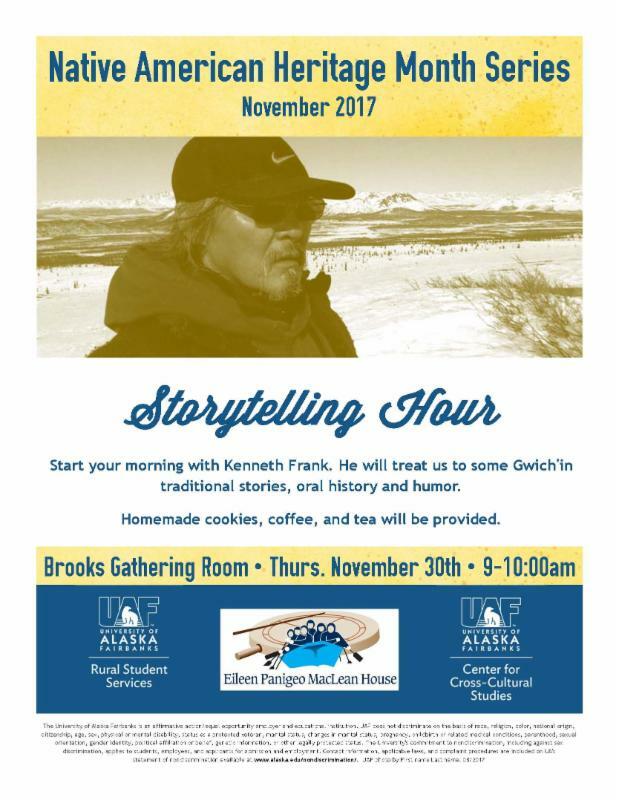 He will treat us to some Gwich’in traditional stories, oral history, and humor. 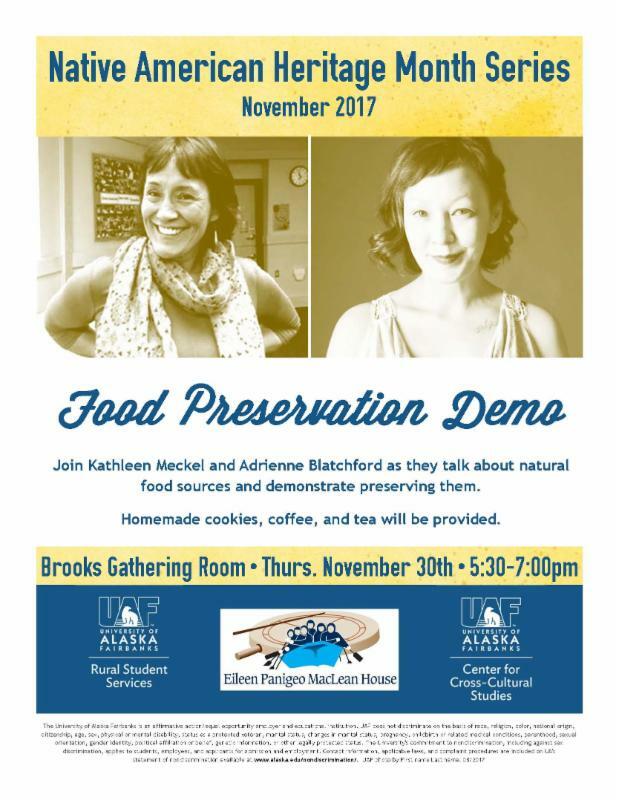 Join Kathleen Meckel and Adrienne Blatchford as they talk about natural food sources and demonstrate preserving them. All events are free and will be in the Brooks Gathering Room. No sign-up necessary! If you have any questions, please contact Brianna Pauling at bpaulin1. If you need to schedule an appointment with an advisor, please call (907) 474-7871 (locally) or (888) 478-1452 (toll free within Alaska). The Native American Scholarships Fund is an endowment established to foster a sense of shared purpose and positive interaction between archaeologists and Native Americans. Scholarships are open to all Native peoples from anywhere in the Americas, Alaska Natives, Native Hawaiians, and Indigenous Pacific Islanders. Since 1998, the SAA has used the endowment income to award the annual Arthur C. Parker Scholarship in support of archaeological training for Native Americans who are students or employees of tribal, Alaska Native, or Native Hawaiian cultural preservation programs. In 2009, the SAA added two new awards in support of undergraduate and graduate archaeology education. Support for these scholarships comes in several ways: through individual donations, an annual silent auction at the SAA meetings, book royalties, and grants. For questions about the applications process or to make a donation, please contact the Committee Chair. To support archaeological training or a research program for Native American students or employees of tribal cultural preservation programs (up to $5,000). To support undergraduate studies for Native American students, including but not limited to tuition, travel, food, housing, books, supplies, equipment, and child care (up to $5,000). To support graduate studies for Native American students, including but not limited to tuition, travel, food, housing, books, supplies, equipment, and child care (up to $10,000). Join us for the Doyon Foundation fall 2017 student dinner! We will have food (including moose soup! ), door prizes, and Native language demonstrations and activities. Students, alumni, family, friends and supporters are all welcome to attend this free event. If you are a Foundation alumni, please let us know if you can bring a dish to share and/or a door prize to donate. The event is FREE but please RSVP at http://conta.cc/2A5BMif.